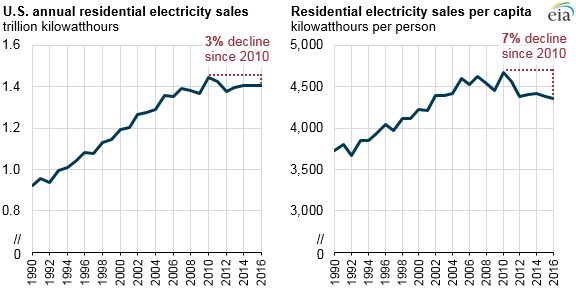 Following sustained growth through 2010, U.S. residential electricity sales have declined in both absolute and per capita terms. Although changes in the weather are a key driver of year-over-year fluctuations, energy efficiency improvements and economic factors have contributed to the decline in per capita residential electricity sales since 2010. Residential electricity sales per household declined even more than the absolute or per capita declines, decreasing 9% between 2010 and 2016. At the state level, per capita residential electricity sales in 2016 ranged from a high of 6,619 kilowatthours (kWh) per person in Alabama to 1,828 kWh/person in Hawaii. These two states were also the highest and lowest, respectively, in 2010. Although not every state reached its peak per capita residential sales in 2010, only nine states have exceeded their 2010 levels of per capita sales in any year since then. Weather is a significant driver of variation in residential electricity sales in many states. Warm weather increases electricity demand as houses use air conditioners, fans, dehumidifiers, and other equipment to maintain comfortable temperatures. The extent to which cold weather influences residential electricity demand depends on heating fuel choices, but many homes use some form of electric heating in winter months. Several of the states with the highest residential electricity sales per capita, such as Alabama, Louisiana, and Mississippi, are in the South census region, where electricity is more likely to be the main space heating fuel. About 60% of Southern homes heat primarily with electricity compared with 22% outside the South. Degree days, used as indicators of heating and cooling energy demand, represent temperature deviations from a base temperature, typically 65 degrees Fahrenheit. For example, a day with an average temperature of 45 degrees would represent 20 heating degree days. Population-weighted heating degree days for the United States declined 13% and population-weighted cooling degree days increased 9% between 2010 and 2016, reflecting both warmer temperatures and population migrations to warmer areas. Some of the states with the largest percentage decline in per capita residential electricity sales were also those with the largest changes in winter weather between 2010 and 2016. 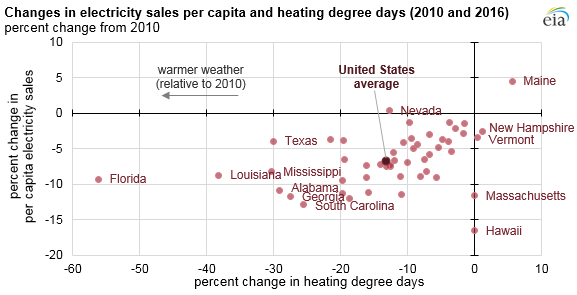 Southern states such as South Carolina, Georgia, and Alabama had 25% to 30% fewer heating degree days in 2016 compared with 2010, and each saw double-digit percentage declines in per capita residential electricity sales. Investments in energy efficiency have contributed to longer-term declines in residential electricity use. On average, from 2013 through 2015, electric utilities, energy efficiency program managers, energy service providers, and other entities provided an annual average of $3.92 in energy efficiency incentives per person, according to EIA’s survey of electric power sales, revenue, and energy efficiency. In 2013 through 2015—the most recent years with data on direct investments in energy efficiency programs—annual residential energy efficiency spending per person ranged from about $18 in Massachusetts and Rhode Island to 4 cents in Alaska. EIA information for 2016 energy efficiency spending is expected to be available in October. More stringent energy efficiency standards for household equipment such as heat pumps, air conditioners, and lighting are also reducing electricity use in residences as older household equipment is replaced by devices that use less energy. For example, residential lighting generally shifted from less energy-efficient lighting, primarily incandescent bulbs, to more energy-efficient lighting, including compact fluorescent lamps (CFLs) and light-emitting diodes (LEDs), as suggested by data from EIA’s two most recent Residential Energy Consumption Surveys (RECS), conducted in 2009 and 2015. In 2009, 58% of all households used at least one energy-efficient bulb indoors. In the 2015 RECS, which was administered from August 2015 to April 2016, 86% of households reported using at least one CFL or LED bulb. Nationwide, 18% of households responding to the latest RECS reported that they had no incandescent bulbs in their homes. Rapid growth in the adoption of small-scale solar photovoltaic (PV) systems in states such as Hawaii and California has contributed to the recent decline in some states’ retail electricity sales. Small-scale solar PV systems, often installed on residential rooftops, offset the amount of electricity that consumers need to buy from the electric grid. In 2016, residential distributed PV generation was equivalent to 15% of electricity consumption in the residential sector in Hawaii, 6% in California, and 3% in Arizona. 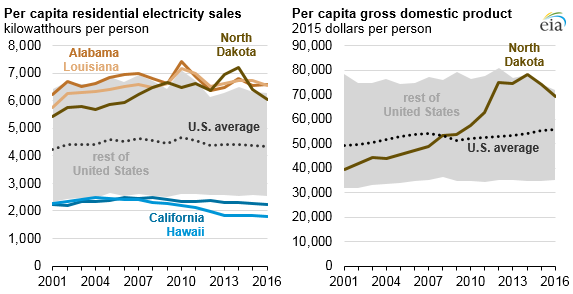 Other factors, such as income growth, have affected retail electricity sales, especially in states such as North Dakota. North Dakota experienced significant economic growth as crude oil production from the Bakken region increased from 2008 to 2015. Annual new housing permits in North Dakota increased from fewer than 4,000 units in 2010 to more than 12,000 units in 2014. As the size of new houses increased and residents who experienced rapid income growth likely increased their home use of electricity, per capita residential electricity sales in North Dakota grew by 12% from 2008 to 2014, the most rapid growth in the nation during this time. With the decline in oil prices starting in mid-2014, per capita real gross domestic product in North Dakota fell by 12% from 2014 to 2016, with new housing permits falling to less than 4,000 units in 2016. During this period, North Dakota’s per capita electricity consumption declined from a peak of 7,241 kWh in 2014 to 6,149 kWh in 2016. More information about electricity sales in the residential sector is available in EIA’s Electric Power Monthly, and additional information about state-level energy data is available in EIA’s State Energy Data System.